Let’s cut to the chase – after 18 months of gainful unemployment, I finally have a job! That’s right. Our visit to Wick last week was not, as it might have appeared, an innocent holiday, giving me an unparalleled opportunity to get my feet and the back of my neck wet. It was, in fact, a job interview (albeit a very wet and windy one). Ebenezer Place. The World's Shortest Street. 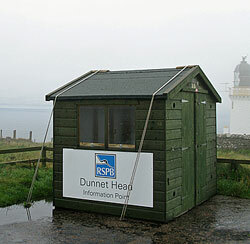 Dunnet Head, where everything is tied down. The Caithness Archive is quite small, just a couple of rooms in the local library, but it’s my kind of place. I’m really looking forward to it – most of my recent career has been on the strategic/ Government agency side of things, so it’ll be nice to go back to the hands-on, practical side of things again, if I can remember how after all this time. But archives is much like riding a bike in that sense, except the seats are more comfortable. 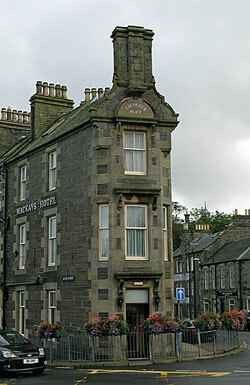 Wick is a little harbour town of around 7,500 souls, on the east coast. (The only other town is Thurso to the north, pop. 9,000 – so, given that the total population of Caithness is under 24,000, don’t expect to find a Starbucks when you come visit!) Inland it’s mostly lowland fields and almost no trees, similar to mid Wales in some ways but with far more ruined stone crofts crumbling slowly to rubble in the fields. Turn around, though, and you find the restless, heaving ocean and, if you look to the north, the Orkneys looming out of the mist like Leviathan coming up for air. The best moment? 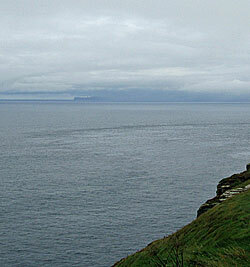 We decided, rain or no rain, that we’d go out onto Dunnet Head, the peninsula that extends north past John o’Groats and really is the northernmost edge of Scotland. The rain stopped as we neared the Head, but instead we found ourselves driving into low cloud, thick as a fog. Fearing the worst, we arrived at the car park, navigating mostly by echo location, when suddenly the mist began to clear, visibly blown aside by the wind like a curtain being drawn across the ocean. Patches of sunlight appeared out to sea (I thought for an instant that an arm clad in purest samite was waving a magic sword out of the water – it was that kind of moment – but it was just a gannet), and the Orkneys materialised like a SF special effect. After that, it didn’t matter that by the time we were back at the hotel it was raining again. Wick also has a little airfield, with flights to Edinburgh and Aberdeen every day except Saturdays, which makes it a little more accessible than the 256 mile drive from Edinburgh would suggest. It also, bafflingly, has one of the largest supermarkets in Scotland – Stop ‘n’ Shop size – bigger than the ones in Edinburgh. Very strange. No ganseys, alas – in any case, everyone was wearing oilskins or other waterproofs – but I’ll be on the spot in future to keep my eyes open. The next few weeks are inevitably going to be a bit hectic – I have to find somewhere to live, and we’ll be looking to buy a house – so please bear with me if I don’t respond to comments or emails as promptly as I’d like. I’d hoped to finish the gansey last week, but as you can see from the pictures, I’ve still got 1.5 inches of cuff to go (it’s hard knitting on a hotel bed!). That’s great news about the job, Gordon. Congratulations!! And that’s a good thing about the large supermarket. Frankly, I suggest that as soon as you are settled in, begin stocking up for a long winter. Mount Tambora is shooting ash into the sky; the last time it did that much was 1815, when it shot so much ash that the summer of 1816 didn’t really happen – every time crops were planted, there was snow, and there were famines everywhere. I think that’s why the Mormons have the rule that everyone is to keep at least a year’s worth of food stored. At least you have plenty of ganseys! Hi Dave, Tamar, thank you! It’s both a huge relief and – of course – a logistical nightmare. I am very glad to hear hear your news. Congratulations. The scenery looks utterly stunning; as indeed does your lovely gansey. 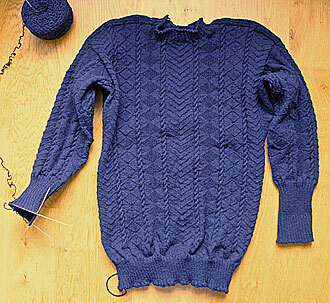 Mine is progressing very slowly, but I am just starting the gusset which is very exciting. All best wishes and good luck with your move. Deborah, Song, Many thanks. Keep an eye on the police reports – if you see anyone in Wick arrested for stripping jumpers off the backs of fishermen, that’ll probably be me. We’re off to visit my parents in Northampton for the next few days – no internet connection – it’ll be like a monastic retreat! I think you could be very well suited up there. I hope you find a lovely home without the 67 steps to the front door (or whatever it is). Congratulations, a new job and live in the North of Scotland, lucky man you are!!!!! Hope you find a nice house and wish you both a good time . Congratulations! May the move and the new job work out well. Oh Gordon, I am sooo happy for you. Good luck on your house hunting. I just went out on a huge financial limb this past week or so by booking a 2-week trip to Ireland/Scotland this time Next year. Perhaps I can stop by on my way to the Shetlands and say hello. I will probably be looking for a second job just to be able to pay for the trip. It has been over 15 years since my first trip to Scotland. Took the train to Thurso just to see what I could see. Loved it. Stop ‘n Shop is no doubt just the tip of the iceberg: before you know it, Wick will have both Starbucks and a Wal-Mart! It is all part of a diabolical plan to strip remote locations of great beauty of their character. Congratulations on the job! and best wishes for a smooth relocation to the wilds of Wick. Hi Suzanne, our comments crossed. Trees. I’m making a point of looking at trees, since, in the words of Paul Simon, “Preserve your memories, they’re all that’s left you” – not many trees in Caithness! Having lived a 71 degrees north for two teaching years I know from bleak and dark. At least you’ll have light at some point every day! But yes – it is nice to make it south every once in a while to see trees and something other than rock. I finally found it nice to be able to see out and away rather than around and through things. Wonderful news about the employment, Gordon, I’m going to “Google Earth” to see just where your location will be! You should read Lillian Beckwith instead! Much better (for which read, Lighter and Less Depressing!) reading. Song, I’m starting to think that a steady diet of The Silence of the Lambs, Thomas Hardy and Joseph Conrad would be less depressing! Despite the undeniable importance of archives and the fact that I love paper (I’ve been told that paper is my vice), I dare to suggest that you may want to try ebooks. I hear that downloading an ebook online is not only cheaper than buying the hardcover, it also eliminates postage and delivery problems, which could be significant up north. Plus, when you’re in the mood to read something you can have it in your hands in about a minute – what’s not to like? I love George Mackay Brown but haven’t read any for ages, but funnily enough I was looking the other day to see if they do any kindle editions, but sadly not many. I was very sceptical about having a kindle, being a great devotee of the real thing, but I absolutely love my kindle. It is very well designed and I am reading all sorts of Hardy and Dickens that I have never seen in book form. So long as you don’t mind the lack of pages, most of the things I download are free which is good for me (being firmly wedged in the Victorian era, apart from the monthly sortie into the book group choice.) The other great advantage is that you can change the font size which is such an advantage at night. I have also read Murakami, but not for a while. Norwegian Wood is very good. I hope all is going well with your moving preparations. Weather down in Brighton wet today, but oddly muggy for the time of year. Well, if you want to cheer yourself up, don’t read George’s “Greenvoe”! Travelling back from Northampton by train it was interesting to see quite a few people reading kindles. (I was curious to know what they were reading, but of course you can’t tell.) One advantage over the iPad is the weight, the kindle being light enough to hold in one hand. I do like the included dictionary, so you can highlight a word and get an instant definition, too. I got into Murakami via the “magic realist” stories – the evil sheep who is really in charge of organised crime, the demon who murders cats and steals their souls so he can make them into a flute, the prostitute who sleeps with clients in their dreams. But I’ve run read them all now, so I’m only now getting round to the “straight” fiction. I just bought Norwegian Wood yesterday. Back to Wick on Wednesday to find a place to rent, which looks challenging – we’ve only found one or two possible properties online, and Caithness in winter isn’t ideal for camping! Wish you good luck for your new job and I hope you found the right house to live in. I just like all the pictures from your blog, but most of all pictures I love that one: “The Orkneys peep out” I think, you posted that picture just for me!!! On the first picture, “Ebenezer Place” I like the blooming flowers, so anybody can see in Scotland you have still flowers on the balcony in September. Of course, the building is great too. 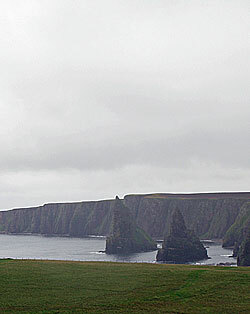 The Duncansby Stacks are great.